I was raised in Los Angeles starting from when I was 5 1/2 (before that I had lived in NYC), and one can only imagine how strange it was for me to move out of a big bustling city to a small town in west Sweden like I did last year. I often get asked why I left LA for Strömstad (the town I live in now), and once I explain that it's because my now-fiancé is from here, people understand, but it is the number one question I get asked when I'm meeting someone new, no doubt. I grew up in a suburb of LA called Valley Village (back when it was still considered to be North Hollywood), so the word "Hollywood" has always had a strong significance to me (not only because, fun fact!, my dad is an actor so I've grown up in the entertainment industry). I remember going on a summer trip to visit my childhood friend in Atlanta, Georgia, when I was 11 years old. Our moms had signed us both up for tennis camp (I played tennis regularly at that age), and on the very first day, as soon as the other kids found out that I was from LA, they immediately referred to me as "Hollywood" every single day for the next 3 weeks. I wasn't offended by it, but it made me realize that "Hollywood" was a special place to a lot of people, especially to people who had never been there and had always fantasized about it, like these kids at the camp. Do you remember watching the movie Hocus Pocus? I mean, who doesn't if you grew up in the 90s, but the main character (Max, coincidentally enough) went through the exact same thing when he moved to Salem from LA. The two guys he met in the cemetery on the way home from his first day of school teased him, called him "Hollywood" and stole his shoes. Luckily my shoes were never stolen, and I wasn't totally offended by being called Hollywood, but I always found it funny, and the older I get, the prouder I am of being from there. So when I saw this sweater on Joanie Clothing's website, I knew I HAD to have it. Since moving to Sweden, I've discovered that I find the most comfort in surrounding myself with clothing and even home goods that make me feel connected to my old hometown, and that definitely includes this jumper. 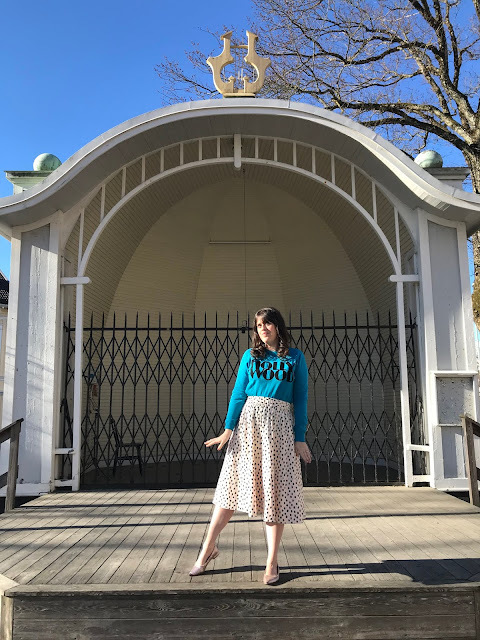 It's soft as can be, can be thrown on with a pair of denim and converse, or can be dressed up tucked into a skirt with a cute pair of flats like in these photos I'm sharing here! I plan on wearing it all spring and summer, and into the fall, too.